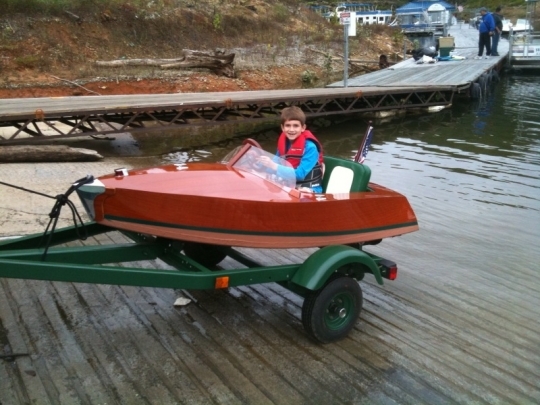 The “Memory” is a beautiful 8 ft LOA mahogany runabout of classic style. It is built primarily of plywood using an epoxy chine and taped seams. Power is provided by a small electric trolling motor mounted in a rudder post aft with speed controls relocated on the instrument panel. A foot mounted push button switch assures safe operation. Steering is accomplished through a simple wheel and cable system. A standard 12 volt deep cycle battery mounted forward provides sufficient capacity for several hours of fun. An on-board charger facilitates easy recharging. Although intended for children, it will accommodate up to 300 pounds. The “Memory” was originally designed for weekend-long family boat building events. Participants can finish this boat in under 16 hours, complete with motor, custom transom graphics and varnish; ready to be launched. Response has prompted the offering of plans, kits, and completed boats in addition to our regularly scheduled family boat building weekends.